View More In Watches - Page 4. Treat yourself to this matching watch earrings necklace rose gold-tone set. Classy and Elegant for work, date, social/family event or any other occasion. Chic and trendy watch set to match any outfit. 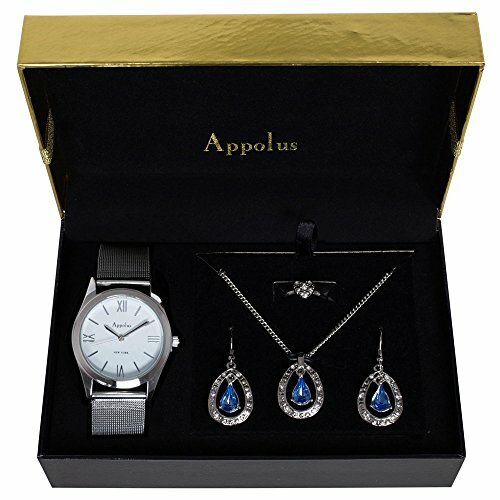 It can be dressed up or down The matching jewelry gift set has a watch, earrings and a necklace in a glitter glossy gift box. The perfect gift for any occasion to a girl, woman. Beautiful matching watch, necklace, one pair of earrings and an adjustable ring set in silver-tone. Chic and trendy set to match any outfit. It can be dressed up or down. Give Her the gift she would love to wear everyday and remember who gave it to her. Case diameter: 37 mm. Adjustable stainless steel mesh band width: 20mm. If you have any questions about this product by Appolus, contact us by completing and submitting the form below. If you are looking for a specif part number, please include it with your message.